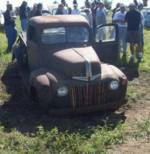 Line-up of Rusty Trucks Photo Picture Classic Cars for sale & Classifieds - Buy Sell Classic Car & Classic Truck Classifieds. Wow all of these have near perfect glass! like the e-100 pickup on the right.